Restoration experts and conservators often go unnoticed in the art world. Not only are these individuals blessed with a dazzling repertoire of artistic talents, they are also highly skilled art historians and scientists. They must understand not only the stylistic nuances of an artist, but be able to recreate them in a seamless fashion. April 6th is the second date touted as Raphael's birthday, and also the date of his death in 1520. 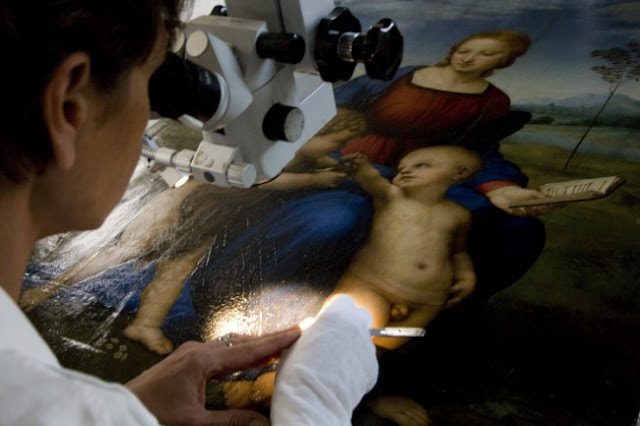 To conclude a series of posts featuring Raphael, I would like to give special tribute to Patrizia Riitano, chief restorer from the Opificio delle Pietre Dure in Florence, who has rejuvenated Raphael's Madonna of the Goldfinch back to a dazzling state. Now back on display at the Uffizi, this work had previously been in a severe state of disrepair. In fact, one marvels at how this painting has survived the ages - given its calamitous history of destruction and restoration. Raphael was also very friendly with Lorenzo Nasi, and as Lorenzo had newly taken a wife, he painted him a picture of a babe between the knees of the Virgin, to whom a little St. John is offering a bird, to the delight of both. Their attitude displays childish simplicity and affection, while the picture is well coloured and carefully finished, so that they appear to be actual living flesh. The Madonna possesses an air full of grace and divinity, the plain, the landscape and all the rest of the work being of great beauty. This picture was greatly valued by Lorenzo Nasi in memory of his close friend and for its excellent workmanship. But it was severely damaged on 17 November, 1548, when the house of Lorenzo was crushed, together with the beautiful houses of the heirs of Marco del Nero and many others, by a landslip from Monte S. Giorgio. However, the pieces were found among the debris, and were carefully put together by Battista, Lorenzo's son, who was very fond of the arts. This initial restoration completed by Ridolfo di Ghirlandaio used nails to re-assemble the panel and repainted damaged areas. The painting later became part of the Medici collection, and subsequent restorations further damaged the work. After a restoration project spanning a decade, in 2008 Patrizia gave us Raphael's enchanting Madonna in a state closer to when it was originally created. Part of a modern restorer's work is to remove damage done by previous restorations. Repainting is then done in a manner that is reversible, allowing future generations to delineate the restoration work, and easily remove it if necessary. Looking at the work in detail is now easy thanks to the Google Art Project. A closer look at this painting is interesting, as it allows us to examine symbolic elements of the painting and consider their origins. Executed between 1505-6, this piece bears the hallmarks of Raphael's Florentine exposure to Leonardo. The triangular composition, the soft focus of the skin tones and background all mark a strong departure from the crisper style Raphael had shown under Pietro Perugino. It must be noted though, despite Leonardo's obvious influence, Raphael's own style was enhanced by these lessons rather than him simply mimicking them. Also seen in other Florence era portraits done in this style is a vivid use of colour, which was less present in Leonardo. Of particular note is the goldfinch. It is an accurate depiction of a European Goldfinch, which are commonly found in Italy. Without knowing what the goldfinch signifies, this looks like a playful image of some children petting a bird. A testimony to Raphael's remarkable talent, he has imparted a sense of grace into what is actually a harrowing Christian motif. 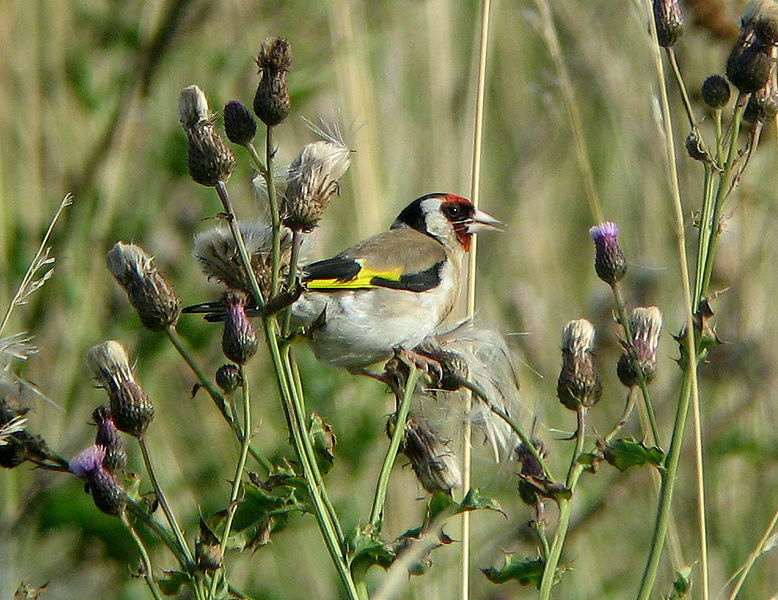 In another example of a symbolic marker inherited from the Medieval Christian Bestiary, the goldfinch is analogous to the pain and torture endured by Christ - as goldfinches endure thorns to eat thistles. Hence, the bird is a symbol of The Passion - and is hauntingly embraced by the infant Christ in this depiction. However, this is not a piece designed to impart the anguished lesson of The Passion in the Medieval style. Hidden within the bird itself is a positive reading - something which we can demonstrate Raphael learnt directly from Leonardo, though is often omitted in most references to this work. 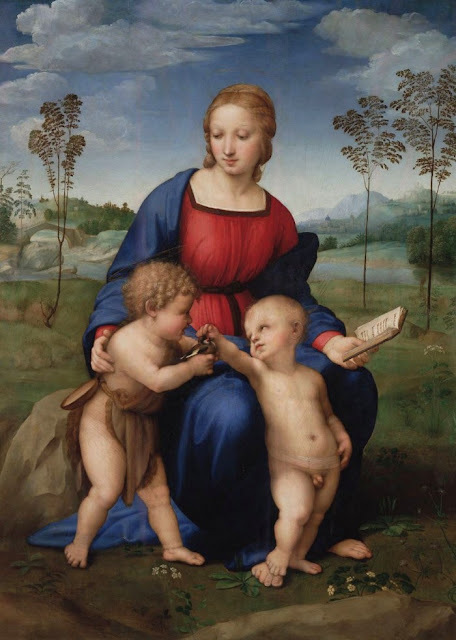 Raphael had used the goldfinch motif in an earlier work, now known as the Solly Madonna. This piece is ascribed to Raphael's earlier Umbrian period, before he became more firmly established in Florence after 1504. The Solly Madonna depicts the infant Christ with a golfdinch, but significantly facing away from him. In addition, he holds a loop of string, signifying he is about to leash the bird with it. In this instance, the bird (facing away from the infant) is a symbol of death, and Christ's final triumph over death is implied by the string leash. 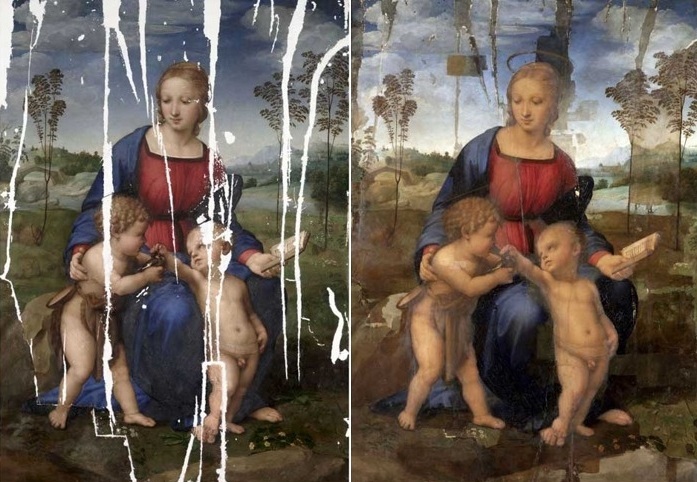 When Raphael came to paint Madonna of the Goldfinch for his Florentine patrons, the symbolism altered from his original Umbrian piece. Like the overall style of the painting, the iconography of the goldfinch also represents a more direct link to Leonardo, with the bird being described in his Fior di Virtu (1500-1510). According to legends attributed to Leonardo and earlier writers such as Cecco d'Ascoli, the bird has a dual symbolic meaning. When it turns away from a subject, it signifies death, whereas when it is shown facing someone it depicts life. With Raphael's depiction of the bird facing the young Jesus, the ordeal of The Passion is subjugated with a blessing for eternal life. In the Middle Ages, goldfinches were known as Saviour Birds and often fashioned as amulets worn to ward off plague. Regardless of one's own spiritual leanings, Raphael's ability to depict tranquil infants with a symbolic premonition of future trials and a blessing of vitality is amazing to behold. As it was a gift to a newly married couple, it would also serve as a lesson for fidelity and the great emotional and physical trials associated with married life and parenthood, particularly for mothers. The city in the background is an another interesting consideration. Whilst elements of the architecture shown are European, the blue dome, so often seen adorning Orthodox Churches, Synagogues and Mosques in the Middle East is a reference to the Holy Land. Idealised representations of Jerusalem were common in Medieval and Renaissance art. On the left we see another architectural element - a stone arch bridge. The earliest surving example is the late Roman era Karmagara bridge in Turkey from the 5-6th century. Numerous examples are also to be found in Italy, as it was a form of bridge commonly constructed in the Middle Ages. Interestingly, these bridges came to have their own symbolic meaning. Due to the difficulties associated with building them, they became known as Devil's Bridges. Many of the examples of this type of bridge in Europe still retain this moniker. It became a matter of folklore that such bridges were symbolic of a triumph over the devil. Hence, in an artistic context became a reference to the Passion. "I think I probably know this painting almost better than Raphael. He looked at it, sure, but all these years I have been looking at it with a microscope. I wonder if he is satisfied. I hope so. Perhaps he'll send me a message from the beyond, maybe an SMS." Da Vinci, L., Richter, J.P., Pedretti, C. The Literary Works of Leonardo da Vinci. Vol.1 University of California Press. 1977. Restoration truly is an art of its own-- so impressive. The presence of the goldfinch is always so interesting, as well. Once you know what it symbolizes, you catch it everywhere... and it really changes how you view those paintings. Great post! I just had my Renaissance students read Vasari's biography of Raphael this past week! They'll be interested to see your discussion of the damage and restoration. I'm glad that you brought up the symbolism of the goldfinch. I had forgotten about that symbolic detail! How fun. I know that we've talked about other bird symbols in various posts on your site (and a little my site), and I think that I may have mentioned that I like the how the pelican was seen as a symbol of Christ. Similar to how the goldfinch is "tortured" by eating thistles, the pelican was (incorrectly) thought to engage in self-torture (it allegedly would pull apart its own flesh in order to feed its young). This sacrifice on part of the pelican was symbolically tied to symbolic of Christ's sacrifice and Passion). My favorite example of pelicans in art is seen in the green tapestry <a href="http://www.wga.hu/art/e/eyck_van/jan/09ghent/1open1/u4god.jpg>behind God the Father</a> (from Jan van Eyck's "Ghent Altarpiece"). @Lily - I really enjoyed doing this post as some of its elements were new to me. I had read about the symbolism of the goldfinch in the past, but only once I had resolved to consider Medieval sources of information did the information about Cecco d'Ascoli and Leonardo's paragraphs on his work come through. The resource used is linked in the word "legends" above. The direction the bird is facing is commonly not described in references about this work, and it was quite exciting to note it was something Raphael would have gotten directly from Leonardo. The same applied for the 'devils bridges' I was more familiar with them as types of bridges built by the Ottomans(such as the famous Mostar bridge) but soon realised they had a deep Medieval symbolic tradition too. @M - I think the Ghent altarpiece is like a visual dictionary for Medieval iconography! It's given me an idea for a little project in the future to demonstrate this in a visual manner. The pelican is indeed one of the Christian Bestiary birds as well, which was discussed in my Carpaccio posts. It is fun to explore these Medieval links with the Renaissance. It is interesting to note Vasari's description of the bird - he rarely comments on allegory, and seems to have no awareness of it in this case too. His closed-off view of the Middle Ages (inherited from Petrarch et al) seems to have done him a disservice in this instance. Luckily Raphael and Leonardo were not as closed minded! Fascinating, as always. I especially enjoyed learning about the symbolism of the goldfish. It is truly a magnificent piece of art. Glad you enjoyed it Vicky! I think you may have meant goldfinch instead of goldfish, though it is interesting to note that the fish symbol is also a Christian motif extending back into antiquity - much older than the Medieval bestiary in fact. A very nice and interesting post both for the conservation news and for the painting itself. You're becoming quite the iconographer. I'll put you up for membership in the Anna Jameson society. Thank you for the compliment Frank :) I am pleased you enjoyed the post. I must admit I have had more confidence to look into sacred images only since corresponding with you, so have to thank you for that! The realisation was that an iconographical puzzle is still exciting, regardless of whether it is the Virgo Lactans or a heron sitting on a roof! The challenge is to develop the research and lateral thinking skills to look beyond the standard texts, which are so often limited to a particular era or genre. Opening my eyes to the Medieval antecedents of Renaissance symbols has been a very exciting endeavour. 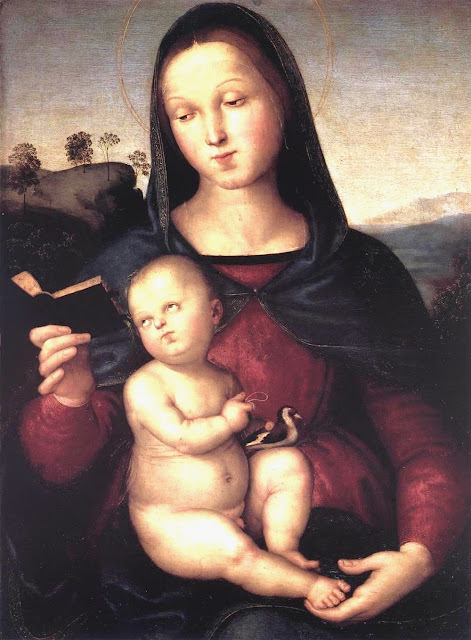 An entire aspect I omitted from the Raphael discussion in this post is how it is another wonderful example of the 'outdoors' Madonna Humilitas, but I left it out to come back to in another post. I dont think I'll have much luck getting into the Anna Jameson society - you've seen a picture of me - if I turned up at such a gathering they'd probably think I was there to do the catering or lift something heavy. ha! Another factor to consider in this painting is that Raphael chose to have the infant John hand the bird to Jesus rather than the usual cross. The legendary meeting of the two children took place on the return from Egypt, and John announces the sacrificial mission by presenting the cross, or in this case the goldfinch. Cheers Frank - I always marvel at how the Apocryphal Gospels seem to have captured artists imaginations so thoroughly. So many of the iconographic clues to sacred art are to be found within them. Any researcher of Medieval, Renaissance and even Baroque art would do well to avail themselves of resources on the subject. One resource I have sighted in a library and am attempting to track down a personal copy of is Art and the Christian Apocrypha by Cartlidge and Elliot(2001) published by Routledge. Marcia Hall's recent book, The Sacred Image in the Age of Art will also be reviewed here in the near future. It's interesting to note one of these tales from the Infancy Gospels also includes a story of Jesus bringing life to a clay bird - though in this instance it was a sparrow, and not a goldfinch - as we can see from the photo, Raphael's depiction of the actual bird is quite accurate. Hence it is not likely that the bird depicted is an allusion to this particular tale - which also makes it into the Quran. Thank you for this article - it reminds me to update my notes before I discuss it again. Bravo Patrizia, indeed. And Bravo to you 3pp for a fascinating post. I have a friend who is a restorer at the Prado here in Madrid, and I must say I agree wholeheartedly with what you say about the artistic talents and the breadth and depth of most restorers' knowledge of painting and art history. It would be great to see a book of essays or articles featuring reflections by restorers of major works of art. Are you familiar with any such work? Hello Lorenzo! How pleasant to have you drop in again. I am pleased you enjoyed the post. You are very lucky to personally know a restorer - I think it is a fascinating occupation! I have assembled a list of references on the topic - which you can peruse at this link. It was great to have this post fresh in my mind while encountering Leonardo's The Litta Madonna last week at the National Gallery. It is easy to see why the poet Shelley was so profoundly affected by the poetry of Raphael's Madonnas. This is a fascinating post. It has inspired me to research the symbolism in more of Leonardo and Raphael's work. Thank goodness there are such talented restorers out there so that we can enjoy works like this for many more years to come!